We now offer hydrostatic test packages for applications static, to 60,000 psig. 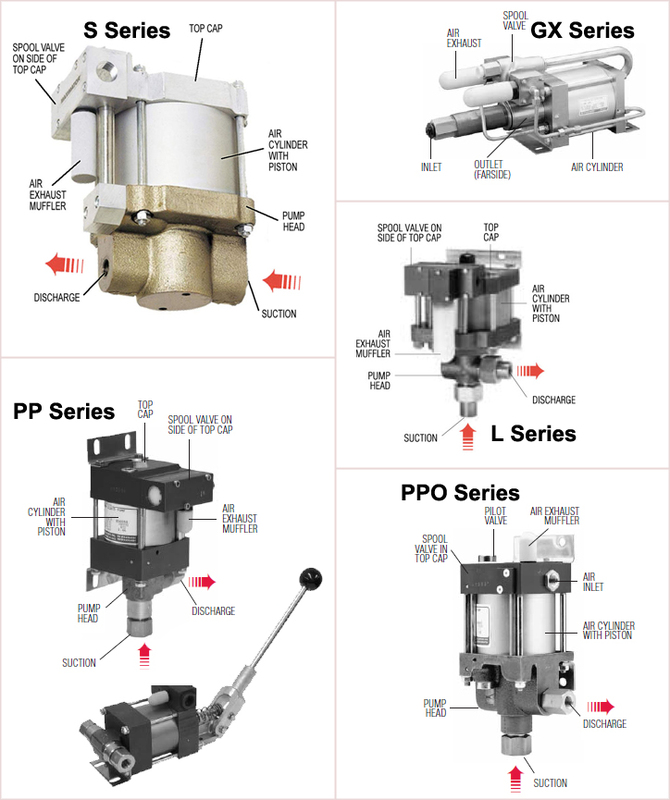 Utilizing pneumatic operation, these units are 100% intrinsically safe. Systems are designed to be user friendly, simple to operate, and highly durable. 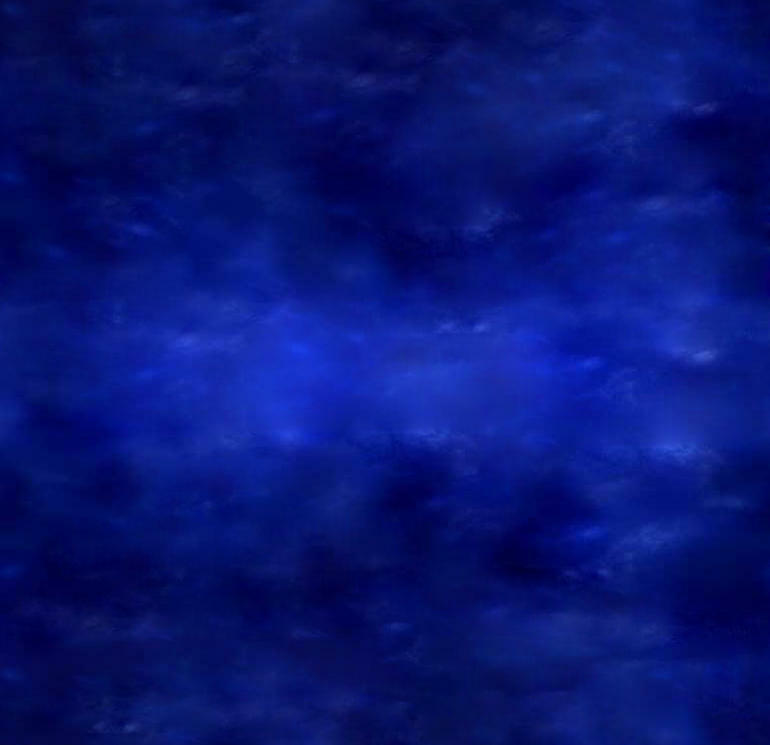 Systems are available in a wide range pressures and volumes. Along with "off the shelf" units, we offer custom built systems to suit your specific requirements. Systems are available in a wide range of configurations. Options include the following: Push button operator controls via air or electric actuation, digital pressure gauges, and electronic data logging. 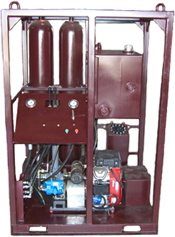 Along with the hydrostatic packages, we offer special packages to actuate hydraulic equipment. 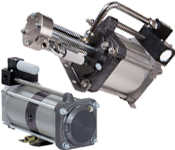 Anything that requires hydraulic pressure to open / close we can build a package for you. These units range in form, from air operated intrinsically safe systems, to mini closing units with accumulators powered by gasoline or diesel power packs. Usage includes, BOP's, Gate Valves, Hydraulic Chokes, Plug Valve Manifolds for Flow Back Jobs (with wellbore pressure gauges), etc. 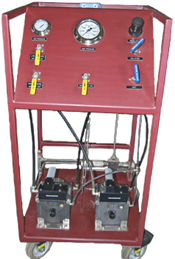 We also offer systems designed to static test hydraulic systems. Test units are at times needed in remote locations. we build "mini" portable test units to suit that requirement. These units utilize the same rugged equipment found on larger systems, simply packaged tighter. Portability in mind, functionality is not compromised. These are available in pressures from static, to 60,000 PSI. Data logging is also available upon request. 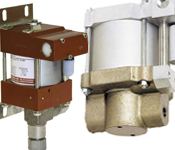 AEC offers pneumatically driven gas boosters and air amplifiers, as well as systems to utilize gasses in a wide range of possibilities. Want more shop air pressure? AEC offers packages to boost your shop air supply as high as 300 psig. Need to transfer gas from one cylinder to another? Want to refill breathing air or even medical grade breathing cylinders? Looking to build a charging station for Nitrogen bottles? Cylinder re-covery? AEC offers packages to suit those needs as well. AEC also offers packaged systems to do PSL-G gas media testing of wellhead and/or other equipment, up to 21,750 psig.